Mechanisms of modification of cast iron and steel were analyzed and thermodynamic performance criterion of modifiers was defined. 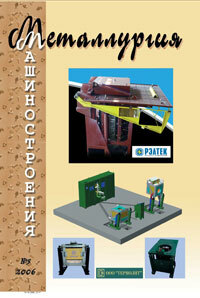 It is shown that in cast irons, Mg, Ca and РЗМ mostly act like refining modifiers. In steel they act as refining and surfactant species. Effectiveness of modifiers for steel is determined by their high degassing and surface activity, low distribution coefficient, weak interaction with ?-Fe, low activity in liquid metal. The article discusses the mechanism of structural and phase changes in gray iron upon inoculation with ferrosilicon with subsequent three-dimensional crystallization with the purpose of resolving the main problem of controlling the structure of a crystallizing structural material. Mixed inoculants of the new generation in the form of a finely dispersed carbon mixture activated by high-temperature treatment and metal silicon have been developed. The shape of graphite inclusions in iron castings is determined by the content of a number of elements that are surface-active against graphite in the melt. Their influence consists in the formation of sorption layers on the surface of graphite inclusions in iron melt with O, N, S, P, Sn, Sb, Bi and others resulting in a reduction of the melt-graphite interphase energy and surface tension of the melt favoring the formation of flaky graphite. The article discusses the heredity of cast irons in comparison with the notions of heredity in animate nature. It has been shown that the operation of inoculating melts with special additives plays a special role in the formation of cast irons' heredity. Effect of various hereditary factors on the inoculants' performance is shown. Inoculant quality requirements based on the made conclusions are proposed. It has been established that as a result of spheroidizing inoculation of synthetic iron the eutectic point of the system shifts to the left along the axis of concentrations, and the thermodynamic activity of carbon in the melt increases, the processes of macro- and microdissolving of carburizer and the graphitization at the melt's crystallization intensify. A probable physico-chemical mechanism causing these peculiarities is given. Recommendations for improving the process of spheroidizing inoculation of synthetic iron in the casting production have been substantiated. Effect of in-mold graphitizing inoculation with FeSi, SiCa, SiBa, low-magnesium master alloy FSMg2, SiSr, SiZr, Si-Rare Earth Metal on the structure formation of nodular iron. Use of in-mold graphitizing inoculation with SiBa, FSMg2 or SiCa after the spheroidizing inoculation with a magnesium master alloy in ladle effectively reduces the chill susceptibility, raises the degree of spheroidization of graphite inclusions, favors the ferritization and dispersion of nodular iron structure. Presented are developments by FGUP ONPP Tekhnologiya, one of the leading scientific centers of the aerospace complex, compositions and methods of using fine-dispersed ceramic mixtures for metalcasting and metallurgical applications: inoculation of white and gray irons, making burn-on preventing dressings for metal molds, high-temperature lubricant for casting tools of die casting machines, high-temperature tuyeres and thermocouple casings. The article discusses the advantages provided by the steel inoculation technology for founders dealing with issues of improving casting quality, such as: improving casting properties of melt, mechanical and service characteristics of steel, eliminating burn-on, reducing sulfur content and others. Recommendations on enhancing the effectiveness of using inoculants are given. Presented are the results of industrial tests of inoculants made by NPP Technology of Inoculating Carbon, Low-Alloy, Manganese and Corrosion-Resistant Steels at the OAO Samara Steel Foundry. It is shown that inoculation does not influence the final chemical composition, including sulfur and phosphorus content, but at the same time positively influences the microstructure, mechanical and service properties of cast steel. The article discusses the formation of efficient modes of operation in an induction crucible furnace with a graphite crucible. It has been established that the supply of the inductor with a multiphase system of lower-frequency currents favors intensive metal agitation. Examples of self-contained inverters that allow forming an inductor supply current of time-different frequencies are given.